These five points are of great importance to your training! Man's upward reach challenges him to improve all that he seeks to accomplish. Challenge yourself! 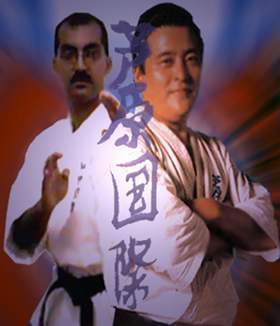 Points "A" and "B" are important in your kumite (fighting). You are standing at point 5 in the symbol. Your opponent attacks from the top of the symbol. A - You move forward to the left or right to counter his/her thrust. B - Your opponent's thrust is more powerful or faster. You move slightly backwards to the left or right to counter his/her thrust. The red in the badge stands for courage, sincerity and passion; blue for vastness of space; white for purity, truth, peace and honesty; and black for steadfastness. 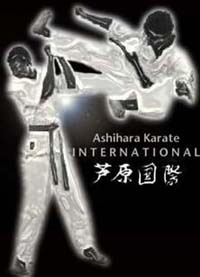 The globe inside the inner circle is the world and represents the spread of Ashihara karate to all corners of the globe; and the fist represents you, the student.